by Nigel Gann, Routledge, 2016 second edition, 249pp. Michael Gove. Remember him? How could anyone involved in the world of education in England ever forget? Now he's Justice Secretary and a leading light in the campaign for the UK to leave the EU in the forthcoming referendum. A right-winger, then. Neocon, even. To a point, yes. When at the DfE he had a portrait of his political hero, Mrs. Thatcher hung on the wall of his inner sanctum. But she was joined by a depiction of commie chief, Vladimir Lennin. If Thatch was there to remind him to keep the blue flame of Toryism burning, the image of Lennin rallied the former Ed Sec to the cause of perpetual revolution. Lennin isn't the only leftist luminary to command Gove's admiration. He's also something of a fan of 'Little Red Book' Cultural Revolutionary, Mao Zedong. Don't just take my word for it. David Cameron was recently cited as saying, "The thing that you've got to remember with Michael is that he is basically a bit of a Maoist - he believes that the world makes progress through a process of creative destruction!" Gove said as much himself in a 2010 article in The Telegraph while still in charge of education. The notion of 'creative destruction' well describes the revolution in education that Gove fomented when in charge of England's schools. An essential component of the Gove's education revolution involved wresting state schools from the clutches of local authorities and transforming them into autonomous academies. It falls to his successor Nicky Morgan to bring the revolution to its logical conclusion by ensuring that all schools are transformed into academies by 2020. Quite what this 'school-led system' will look like once all the pieces of the educational jigsaw so gleefully thrown into the air have landed, no one really knows. That's 'creative destruction' for you. Once stand-alone academies were 'the thing', but now they're not. Then it was big academy chains, but some of them are little better than the bad old LA's at turning around underperforming schools. Now the preference is for schools to organise themselves into localised Multi Academy Trusts. I can see the sense in that in a 'better together' sort of way. But if were not careful, one thing that looks like being creatively destroyed in the process will be local school governance. That's why I've prefaced my review of Nigel Gann's helpful book with a contextual preamble. Most everything he has to say about school governance is excellent. If governing boards operated in line with his guidance we would indeed have better governors making better schools. But it is possible that MATs may be set up in such a way that many of the powers of governance described by Gann could be stripped from local GBs. In that case they would end up as little more then 'focus groups' reporting to the MAT board. In a way this development renders Gann's work out of date, even though it is an updated second edition brought out only this year. That in itself is a mark of how rapidly the educational landscape is changing. Which is not to say that the author fails to give attention to new developments in education and how they may impact upon governance. The last two chapters 'Schools in uncertain times' and 'The future of governing schools' hint at future possibilities and challenges, and lay down some useful 'future proof' principles. But the government has now determined that all schools become will become academies, preferably within a MAT structure by the end of this parliament. As a result governors are in need of more detailed advice on joining or setting up a MAT and what that may involve for their governing board. Caveat emptor. 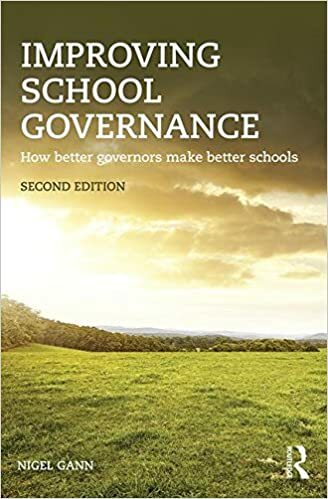 At the very least governors considering joining a MAT should first read this book and weigh up the extent to which they will still be governing their school after they have signed on the dotted line. As far as I can see little work has been done on producing model Schemes of Delegation that will allow local governing boards to retain a large element of their strategic powers within a MAT set up. The NGA talks about the need to get this right, but showing what that looks like in terms of a guidance document containing various adaptable Schemes of Delegation models is another thing. (The NGA's Governing Groups of Schools is useful, but provides no model SofDs). Yet for GBs looking to join or set up a MAT that is one of the key things to consider. Many have been enticed to enter the Promised MAT-Land, only to find themselves robbed of their powers with the MAT board imperiously calling the shots. Result; some seriously disgruntled local govs. Gann commends a collaborative model where 'power and control are dispersed rather than concentrated' and 'local stakeholders and staff can have a sense of belonging'. But in large MATs, or 'chains' such as E-ACT those are often the very things that are lacking. These 'stretchy MATs' that link together schools scattered across England operate less like governing boards responsible for a collection of schools and more like LA's. Sir Michael Wilshaw agrees, writing in a recent memo to the DfE, "many of the trusts manifested the same weaknesses as the worst performing local authorities and offered the same excuses." Yet the role that governing boards are meant to fulfill needs doing, both at the individual school level and in terms of an overarching MAT board. It's got to be about vision, strategy, accountability, ensuring value for money, stakeholder engagement, and so on. When governance structures start looking more like dysfunctional local authorities something has gone badly wrong. Schools are best governed individually and collectively by properly skilled-up and empowered local stakeholders. If MATs are set up wisely with a fair distribution of powers, then LGBs as well as MAT boards will have a lot to learn from this work in terms of how better governors will make for better schools. But if not, we may end up with an education system has has little or no governance at all. At least not at a local level. And that would be more an act of willful vandalism than creative destruction. * I am grateful to the publisher for a providing a complementary review copy.